True confessions: I don't think I understand this film. With the exception of the abysmal Shakha Proshakha, Satyajit Ray's films have overwhelmed me (in good ways), but this one...no. 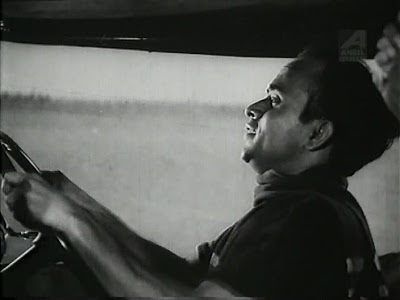 Reading what other people have to say about it indicates that some find the casting of Soumitra as the Rajput taxi driver Narsingh—a cultural identification the dialogues emphasize over and over again—unbelievable, while others think he played against his delicately-mannered Bengali type quite successfully. I don't know what mid-twentieth-century Rajput taxi drivers who find themselves in rural Bengal are supposed to be like, but a question of casting seems silly. If the English Daniel Day Lewis can play Abraham Lincoln 150 years later, why can't Soumitra Chatterjee play a fictional Rajput? The man is one of India's finest actors, especially under this director, and had already shown enormous talent in three of Ray's films (Apur Sansar, Devi, and Teen Kanya), so why not cast him? It is his job to be someone other than who he is. 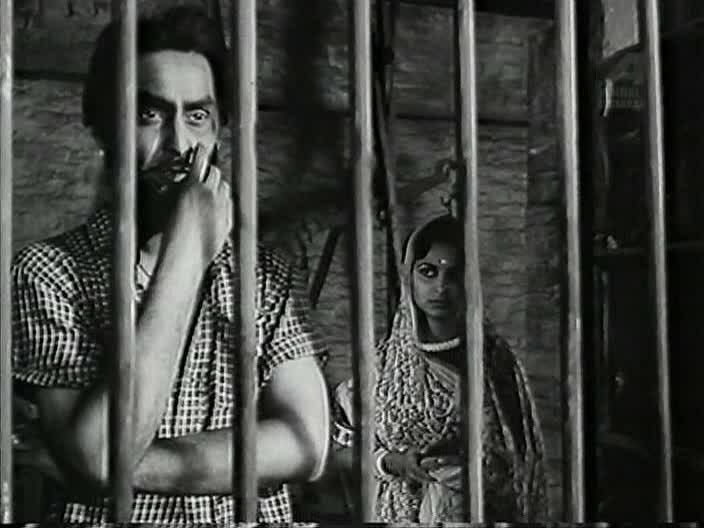 I do find it interesting that a basic description of his characters in Ray's projects to this point is "Bengali university student in Calcutta"—as it would essentially be in Charulata and the flashbacks in Kapurush in subsequent years—but these are all very different roles in fundamentally very different stories. Unfortunately, the makeup crew overcompensated in Abhijan—I like to think of them leaving a production meeting grumbling "We have to turn Apu into a Rajput?!?" and grabbing shoe polish in desperation—and their alarming application of pancake and what is surely fake hair everywhere above the neck works against a naturalistic portrayal. In Abhijan, Narsingh's determination and ferocity are (I think?) mirrored in his beloved car, barreling along the rural roads in a place neither of them really belongs. He very nearly crashes every aspect of his life (livelihood, friendship, romance), but what I cannot figure out is whether there is more to this series of bad decisions than "Rajputs are hot-tempered and tempestuous." The book Portrait of a Director: Satyajit Ray by Marie Seton says that Ray's initial involvement with the film was only as a screenwriter (adapting the novel by Tarasanka Banerjee), with the film to be directed by someone else, but that he was eventually persuaded by the producer/director to take over the whole project. 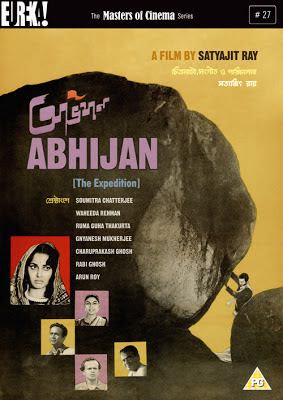 Abhijan ended up being Ray's biggest box-office hit in West Bengal, which indicates that it connected with its original audiences in ways that it does not with me. are a representation of "the burden of sin" or inalterable forces in our lives that we must learn to live with, work around, or yield to. I am so glad I read this; I hadn't been sure what to make of the rocks other than a striking and stark visual that seemed to loom over the fates of various characters. Robi Ghosh, though, I understand. He is 100% excellent, convincing, and attention-worthy. Here he seems to be less comic sidekick than...moral relief, maybe, thanklessly struggling to keep Narsingh on the road. I love him. And for the Ray drinking game: people looking through slats! DRINK! And yes, that is Waheeda Rehman as one of Narsingh's love interests. She's great in her small, kind of stereotyped "prostitute with a heart of gold" role, standing the ground she is convinced is right and safe. I'd love to see these two actors together again. 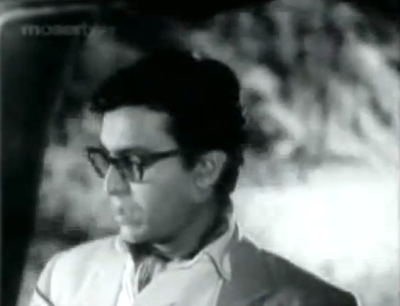 Sweet girl (Sandhya Roy) attracts two brothers, one as her music teacher (Soumitra) and one as her love interest (Biswajeet), without them realizing the other's involvement. Illnesses and a vanishing family fortune (sped along by cagey servants) further complicate the relationships, even after everyone figures out they all know each other. 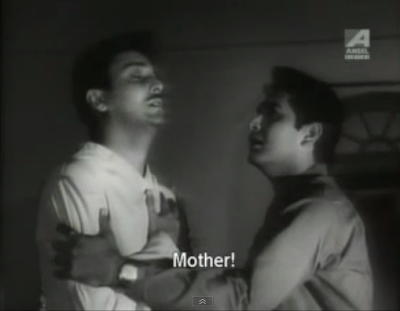 Click here for more filial exclamations by Soumitra. As with Abhijan, it's Robi Ghosh who makes this film for me. He plays Soumitra's meddling, fast-talking musical agent, and it's hilarious to watch these two together, one tall, regal, and subdued, the other seemingly half his size yet far more energetic and emotional. His character isn't terribly important to the story, but he's the most fun person to watch, as the two brothers are kind of whiny and mopey and the heroine does little other than look cute and sing. Meh. Side note: do any of you have strong feelings about Biswajeet? I've only seen him in a few things and find him pretty but not otherwise noteworthy, at least so far. Any recommended films? A comedy of mustache-related shenanigans! These stem from psychological/emotional manipulation by psychiatrist Soumitra of Aparan Sen (to whom he has taken a fancy) and of her boyfriend (Satindra Bhattacharya). Soumitra and Aparna's bags get mixed up on a train, he angers her, she intrigues him, you know the drill. To someone who has only seen each film once, it does bear some resemblance to the later Gol Maal; both use the mustache as a way to signify two different types of men, and both have their male leads deploying his mustache status for personal gain. The basic idea of an imposter using his superior intellect to get something he wants at the cost of others is such a chestnut that it needs very skilled hands to make something compelling out of it. Fortunately, the screenplay is by Ray (who also did the music) and based on a story by Bibhutibhushan Bandyopadhyay, whose works are also the basis of the Apu Trilogy and Ashani Sanket. However, all the good writing in the world cannot change the fact that at its core this story sees the unchecked triumph of a very unethical person (who should be barred from professional practice at the very least), and now that I have finished the film and am no longer under the sway of the admittedly entertaining portrayal of the story, it's hard not to be frustrated by that. 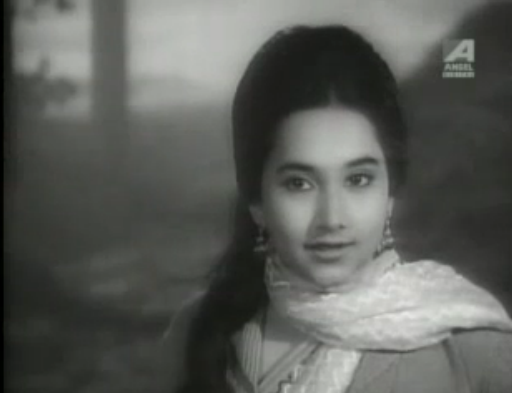 Aparna is much less impressive here (1970) than she was in Teen Kanya almost a decade earlier. Fussy younger woman is not the easiest role to sell, either, and unfortunately her stomping around doesn't work as something lovable to an older, highly educated man without dredging up weird Electral stuff that I don't want to think about. She's certainly a live wire in her own way, but to me she didn't seem very pleasant. The match seems even less appropriate than it did between their worlds-apart characters in Teen Kanya, frankly. Soumitra has better chemistry and more natural, peer-like conversations with one of the other adult female characters in the movie (Gitali Roy, who is in Charulata and Mahapurush), making me wish Aparna came off as more mature. I also think the characteristics they demonstrate in the film bode ill for their romance after its end; they're both egotistical and he borders on domineering. Then again, I saw this movie without subtitles (relying on the discussion at Old Films and Me for the plot), so there may be more mutuality in their exchanges than I could discern. Thank goodness the filmmakers gave the dual role to someone plenty capable of it. The Many Moods of Light Comedy Soumitra, with their attendant costuming and mustache (or not), contribute a lot to the pleasure of the progression of story. He has some hilarious expressions and gestures of "Fraaaaaack" when his cover is almost blown. 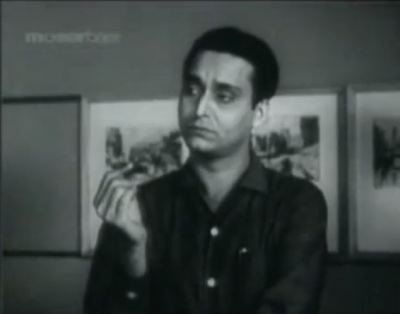 I haven't seen much of his comedic range yet—Basanta Bilap, moments as Feluda and in Teen Kanya—but so far so good. 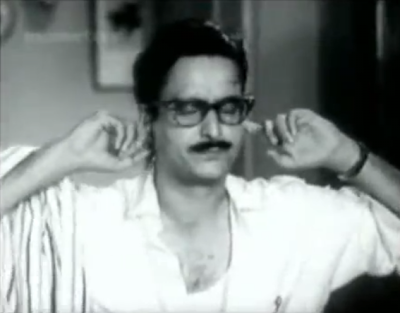 As with Khudito Pashan, it probably isn't necessary to be a Soumitra fancier to like this film, but it helps. How does he make his face look so much older here than in the rest of the film? ACTING! I'd like to see it again, with subtitles if at all possible, hoping that the dialogues temper my misgivings and provide as much joy as the ascot and brainy specs. Beth, I do love me some Biswajeet, but I may be in the minority. He is so wonderful (IMO) in BEES SAAL BAAD. 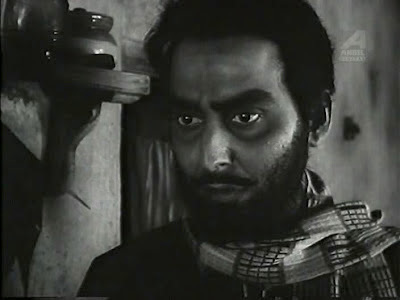 I have one of his old Bengali films on DVD, but have yet to watch it. Quite frankly, I will watch anything that Biswajeet stars in. Thanks for this little series, but unlike you, I really enjoyed Abhijan, which I'd describe as the struggle between aristocracy and meritocracy, because Narsingh's caste, that of the Kshatrya, or warrior, is what sets him apart from other lower-caste people. But he's assailed by moral problems which lower-caste people (his driver Rama, for one), or even the caste-critical Christians (Joseph, Milli etc.) handle far better than he does. So he's facing the classic conumdrum of the elite who should be moral models because of their rank, and are expected to be that, but in fact are only human beings like the rest of us. And my response: I like that reading very much. Greed, pride, and other selfish motivations seemed to talk more than morals for most of Narsingh's decisions, didn't they? I did not catch the ethnic identity(ies) of the guy trying to get Narsingh into dirty work, but even he did not have any trouble with moral difficulties (he just picked the wrong side). AHAHAHAH that's hilarious! How did I miss that? I loved reading your article here. And without your permission I have shared this with Soumitra Chatterjee's page in Facebook. If you mind sorry for that. One query are you now at Calcutta. And yes, I am currently in Calcutta but not for much longer. I am an anachronism. A Soumitra of the 60s -70 s fan. You don't write about his feluda, apu or hirak rajar deshe. Check out his new movies Praktan and beka sheshe.